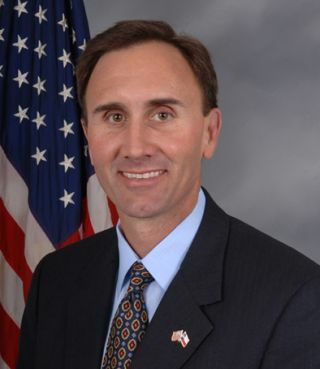 U.S. Rep. Pete Olson (R-Texas). WASHINGTON ? As the White Houseembarks on a summer roadtour to promote its economic recovery efforts, Republican lawmakers arecriticizing President Barack Obama's plan to scrap the nation's moonprogramand the thousands of highly skilled jobs that could be lost as a result. In a July2 letter to U.S. Vice President Joseph Biden, Rep. Pete Olson(R-Texas)said Obama's $787 billion economic stimulus package signed into law inFebruary2009 had done little to stem job losses in Texas and other states hitby theailing economy. At that time our nation?sunemployment rate was over 8percent and the administration projected that the stimulus, if enacted,wouldkeep the unemployment rate under 8 percent,? Olson wrote. "Yet, sincethestimulus was enacted our unemployment has hovered closer to 10 percentandcurrently stands at 9.7 percent." In June Biden and other White Houseofficials hit the roadas part of the administration's "Summer of Recovery," a six-week tourof states expected to see an increase in economic development projectsand jobgrowth as a result of stimulus spending. The White House estimates thatthrough March of this year,the stimulus package saved or created as many as 2.8 million jobs. ButOlsonasserts Obama's planto scrap NASA's Constellation program, a 5-year-old effort toreplace theretiring space shuttle with new rockets and spacecraft optimized forlunarmissions, threatens as many as 30,000 jobs across the country,includingHouston, home to NASA's Johnson Space Center. Olson also took issue with theadministration's moratoriumon offshore drilling as it grapples with a massive oil spill in theGulf ofMexico, calling it "a devastating blow" to that region. "So asyou begin your 'Summer of Recovery' activities, I invite you to come toHoustonand see the impact the administration's policies have already had, andthenegative consequences they pose should these policies continue," Olsenwrote. Olson and 27 members of the Texascongressional delegationurged Obama in an Oct. 5 letter to redirect $3 billion in unspenteconomicstimulus money to NASA, a cash infusion the group said was needed tosupport arobust human spaceflight program and save jobs in Texas and around thecountry. "Last year, a Presidentially-appointedcommission which was created to analyze the various decisionsfacing NASA'shuman space flight program reported an influx of $3 billion would helpput ourhuman space flight program on a sustainable path," Olson said in theletter to Biden, referring to the findings of a blue-ribbon panel ledby formerLockheed Martin chief Norm Augustine. Thatpanel concluded, among other things, that a funding boost toNASA'stop-line beginning in 2011 that gradually ramped up to an additional $3billiona year would enable the agency to explore beyond low-Earth orbit. Nine months later, Olson said, "withbillions ofdollars unspent and as aerospace jobs are lost never to return, ourletterremains unanswered." In June Obama notified lawmakers thathis administrationwould shift $100 million of NASA's $4.2 billion funding request formannedexploration programs in 2011 to the U.S. Commerce and Labor departmentsto payfor economic development initiatives in Florida and other statesbracing forjob losses when the spaceshuttle retires next year. In a letter sent July 1 to Reps.Frank Wolf (R-Va.) andDarrell Issa (R-Calif.), Olson and seven other Texas Republicans arguedthereis no need for NASA to lose those funds to jobs programs administeredby otheragencies. Wolf and Issa are the ranking members of the HouseAppropriationscommerce, justice, science subcommittee and the House Oversight andGovernmentReform Committee, respectively. The letter, co-signed by Rep. RalphHall, the ranking memberof the House Science and Technology Committee, asserts that theCommerceDepartment alone was given $7.9 billion in 2009 economic stimulus fundsfor "jobcreation," of which $4.7 billion has yet to be spent. "This $100 million should come out ofthat budget,"the lawmakers wrote. As of June 4, the federal governmentobligated a total of$397 billion in economic stimulus spending and provided an estimated$223billion in tax relief for families, totaling roughly 78 percent of the$787billion economic stimulus appropriation, according to a June 17 WhiteHousereport on the status of Recovery Act spending.